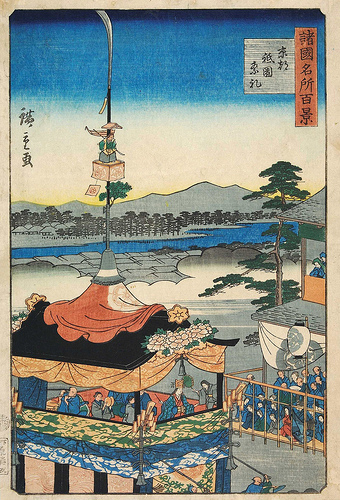 The Gion Festival is an annual event dedicated to the deity of Yasaka shrine. floods,fires,and earthquakes.To keep the bad omens at bay and the good spirits strong and content,special protective or goryo-e festivals have been held here since ancient times. goryo-e.After a series of devastating plagues,the reigning emperor desperately decreed for special prayers to be offered at Yasaka Shrine,one of Kyoto’s oldest and most important goryo-e shrines. it had also become a way for craft guilds and merchant families to compete in showing off their wealth and tastefulness.Large floats,musicians,dances,comic plays,and artistic treasures were all part of the celebrations by the close of the 10th century. 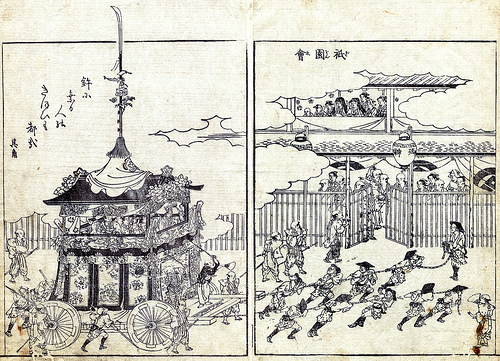 As the floats became increasingly elaborate and heavy,large wheels were added so that they could be rolled instead of carried.from the late 16th century onwards,as a result of the growing prosperity of Kyoto’s merchants,artworks from china,persia,and even Europe found their way along the Silk Road to the capital. The grand parade now consists of two parts;the Saki Matsuri parade is gorgeous and boisterous with many floats. In contrast,the recently-revived Ato Matsuri is held in a much quieter atmosphere without stalls or extra sideshows.